I have lived in Philadelphia for almost ten months now and that time can be split into two different residences. For the first, I took the El to and from Centre City. For the second, I walk to and from work. I look for living spaces near transit lines. In Chicago I took the El for eight years to get home. But to get to work, I often used the 143 express bus. Personally, I prefer trains and subways to busses—faster, dedicated right-of-way, Amtrak even has WiFi. But, busses are an integral part of a dense city’s transit network. You can cram dozens of people into one vehicle and remove several cars from the road. 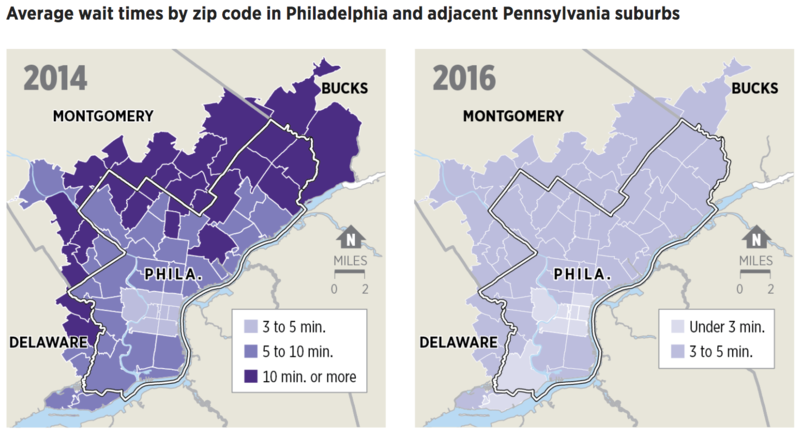 Here in Philadelphia, however, as the Inquirer reports, bus ridership is down over the last two years at the same time as ride-hailing apps are growing in usage. For those interested in urban planning and transit, the article is well worth the read. But let’s look at one of the graphics for the article. The map uses narrow lines for bus routes and the designer wisely chose to alternate between only two shades of a colour: high and low values of either growth (green) or decline (red). But, and this is where it might be tricky given the map, I would probably dropdown all the greys in the map to be more of an even colour. And I would ditch the heavy black lines representing borders. They draw more attention and grab the eye first, well before the movement to the green and red lines. And the piece did a good job with the Uber time wait map comparison as well. It uses the same colour pattern and map, small multiple style, and then you can see quite clearly the loss of the entire dark purple data bin. It is a simple, but very effective graphic. My favourite kind. Anyway, from the data side, I would be really curious to see the breakout for trolleys versus busses—yes, folks, Philly still has several trolley lines. If only because, by looking at the map, those routes seem to be in the green and growing category. So as I complain to everyone here in Philly, Philly, build more subways (and trolleys). But, as the article shows, don’t forget about the bus network either. Credit for the piece goes to the Inquirer graphics department.